This cake is elegant and easy. Delicious alone, it also pairs nicely with berries and cream. Note: Please read and follow the recipe carefully; it calls for our Gluten-Free Bakimg Mix, NOT our Gluten-Free Multi-Purpose Flour. 1) Preheat the oven to 350°F. 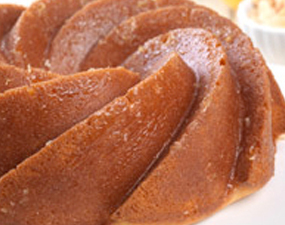 Lightly grease a 10-cup bundt-style or tube pan. 2) Whisk together the baking mix and the almond flour; set aside. 3) Beat together the sugar, soft butter and extracts; scrape the bottom and sides of the bowl. 4) Add the eggs one at time, beating well after each addition. The batter will look thin and a little curdled. 5) To minimize the amount of air beaten in, use medium-low speed on your hand-held or stand mixer to blend half the dry ingredients into the egg mixture. On the same speed, mix in half the milk or buttermilk. Mix in the remaining dry ingredients, then the remaining milk. 6) Scoop the batter into the prepared pan, tapping the pan on the counter to settle the batter and remove any large air bubbles. 7) Bake the cake until a cake tester inserted into the center comes out clean and the middle springs back when pressed lightly, 40 to 45 minutes. Cool for 20 minutes before turning out onto a serving plate. 8) While the cake is still warm, prepare the glaze. Melt the butter and blend in the honey and lemon peel. 9) Brush the glaze over the cake slowly, allowing it to soak in. 10) Cool completely before serving. Yield: 10 to 14 servings.